Click to view the course introduction video. Financial Basics makes it easy to give your first-year students a solid foundation in basic financial management. Financial Basics is appropriate for both four-year and community college students. Upon completing the course, each student will have set short and long-term financial goals, created a monthly budget, and passed a quiz on nearly twenty essential financial concepts. Each student completing their course also receives a verifiable completion certificate. 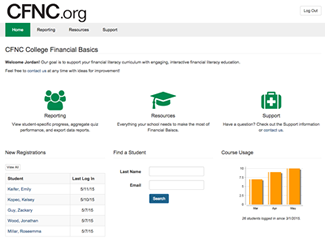 College administrators access their Financial Basics control panel through their CFNC.org accounts. If you previously had access to either Financial Literacy 101 or Advanced Money Management, your account is already set up! To open a new administrative account, please contact your school's CFNC.org representative. Financial Basics is a free service offered by CFNC.org. All colleges and students in North Carolina are eligible to participate! Please contact your school's CFNC.org representative to set up an administrative account.